Looks like the sales are heating up this week. 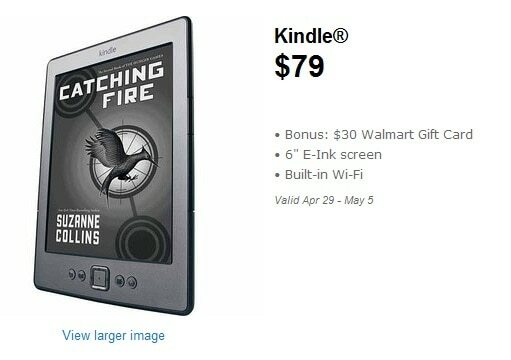 Walmart is pitching the K4, or basic Kindle, on the front page of their advert this week. It's selling for the regular price, but they are throwing in a $30 gift card. That's not a bad deal, but I suspect that you have to mail in a rebate in order to get the card. BTW, don't go looking for this on their website; I don't think they're allowed to list it. But you will see it in the online advert. I’d be surprised if this didn’t work just like the 50 dollar card they gave with the Fire a few months back. They should just give you a gift card when you check out.